Sai Balasubramanian, J.D., is originally from Dallas, Texas, and is currently an M.D./J.D. dual degree candidate at the SIU School of Medicine and School of Law. His areas of specialty outside of clinical medicine include corporate governance, healthcare administration, and health policy. In his previous career in strategy consulting, he advised large corporations on how to optimize their business, compliance, and profitability standards. Sai enjoys speaking and writing about healthcare, law, and management related topics for various media outlets and professional organizations. 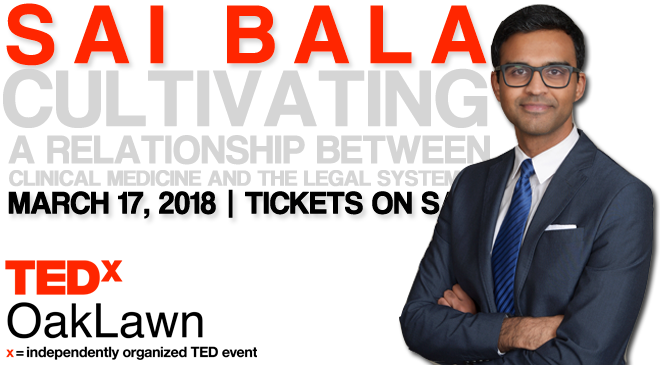 Congruent to the “Tabula Rasa” theme of TEDxOakLawn, Sai is interested in exploring the novel and increasingly growing intersection between technology and medicine, specifically with regards to the bioethical questions and frameworks that emerge alongside medical innovation. Additionally, Sai is looking forward to meaningful and enriching conversations on a variety of disciplines at TEDxOakLawn. Congruent to the “Tabula Rasa” theme of TEDxOakLawn, Sai is interested in exploring the novel and increasingly growing intersection between technology and medicine, specifically with regards to the bioethical questions and frameworks that emerge alongside medical innovation. Additionally, Sai is looking forward to meaningful and enriching conversations on a variety of disciplines at TEDxOakLawn. His presentation, "Cultivating a Relationship between Clinical Medicine and the Legal System" will be one of ten speakers on March 17th beginning at 2:00 p.m.